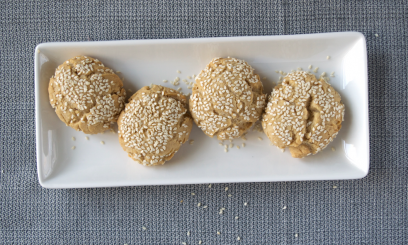 These cookies are enjoyed especially during the lenten season as they are made without olive oil and appropriate for even the most strict fasters. So good and so easy you’ll love them year round – and less than 45 minutes from start to finish! Combine flour, baking powder and salt in bowl and set aside. Place sesame seeds in low sided bowl. Cream tahini, sugar, cardamom and vanilla powder. Add water and orange juice to tahini mixture and stir well until smooth. Mix in flour until mixture forms a soft, not sticky, dough. Fill a 1/3 measuring scoop with dough, turn out onto counter and cut each scoop into 2 pieces for 20 pieces total. 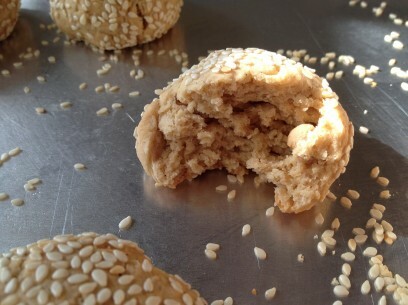 Roll each piece of dough into a ball and roll ball in bowl of sesame seeds. 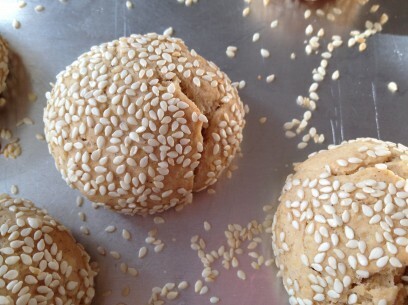 Place sesame balls on ungreased baking sheet and gently press down into a 3/4” high disk. Bake at 350 for 35 minutes. Allow cookies to cool for at least 30 minutes before serving. 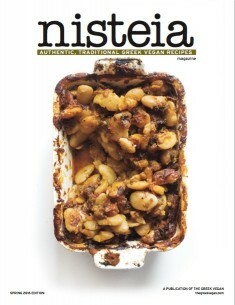 Dedicated to celebrating the simplicity and beauty of authentic, traditional Greek vegan food. This recipe looks very good. I have just discovered your web site and I’m going to try many recipes. It all looks so good! Today, I want to make these cookies and I was wondering if I can replace the vanilla powder with vanilla extract. I’m wondering the same thing. I’ve never even heard of vanilla powder. I’ll have to pick some up then! Thanks for the tip. Very nice cookies. I think i put in a little bit too much of the cardamom but the result is a tasty cookie, goes well with black coffee. I am about to make these biscuits. I will replace water with white wine. See how I go. I juste made these. They are amazing and very easy to make. They won’t last long. 😛 Thanks for the recipe.